JC Gonzalez is a visual Interdisciplinary and community-based artist. 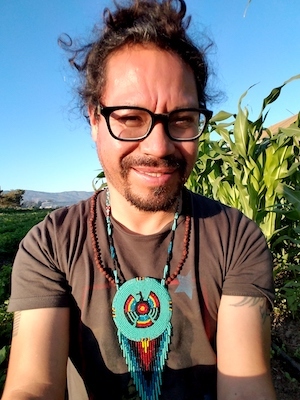 His work includes acrylic, oils, watercolor painting, drawing, murals, installations, and creative happenings, nature, social justice, and human rights themes flow throughout his work; Gonzalez infuses his own abstract painting with a celebration of the spirit of his ancestors and indigenous origin informed by nature with a queer sensibility. Gonzalez grew up in Salinas, California where he develops, teaches, mentors, and shares with the power of arts for creative expression, leadership, advocacy, health equity, social transformation, human rights and environmental justice. Gonzalez has also been a catalyst and mentor to younger members of his community; his work with incarcerated youth, to interrupt the schools to prison pipeline; he teaches k through 12 grades, also part-time Art Faculty Hartnell Community College and Artistic Director and Creative founder of The Urban Arts Collaborative (UAC) a multi-disciplinary, socially conscious arts organization, weaving interconnected issues of critical importance for the community, such as creative expression, food justice, equitable land use policies, and youth leadership. Gonzalez received his Master in Fine Arts in Creative Inquiry Interdisciplinary Arts in 2014 from the California Institute of Integral Studies in San Francisco, CA. He attended San Diego State University, where he graduated with a Bachelor of Arts in Liberal Arts and Sciences Art with an emphasis in Studio Arts in 2008. In addition, Gonzalez joined the the Salinas Public Arts commission in 2018.